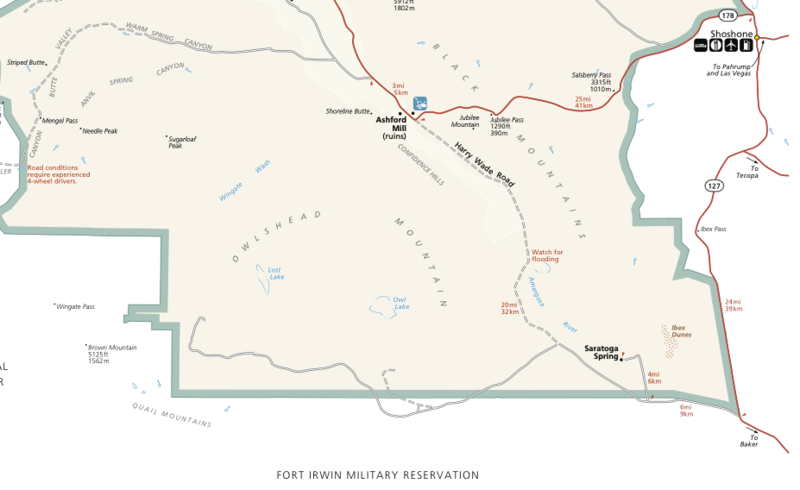 It seemed to be getting about 1 degree warmer each day of our stay in Death Valley and so we knew that, soon enough, it would get up into the temperature range that we consider less-than-ideal. Our last full day there was the day we explored the old mines, caves and the Heart-Shaped Pool up in the hills behind the Geologists’ Cabin. Once we got back to the cabin we decided to start the packing and cleaning process so we could head out at an earlier and cool time of day. We drove away from the Geologists’ Cabin at about 7:30 in the morning and headed out from the Striped Butte Valley via Warm Spring Canyon. When Warm Spring Road connects with West Side Road we turned South and within about three miles of fun, shallow, drifting sands where we pretended to be Ivan “Ironman” Stewart racing in the Baja 1000 we arrived at Badwater Road where we again took a right and continued our southward path out of the Park at a more sedate pace, for a while. All of a half mile after getting onto Badwater Road we came across a faded sign of interest on the right side of the road and stopped to take a look. The sign was faded enough that you could not read it from the driver’s side seat or it may have been due to my failing middle-aged eyesight. 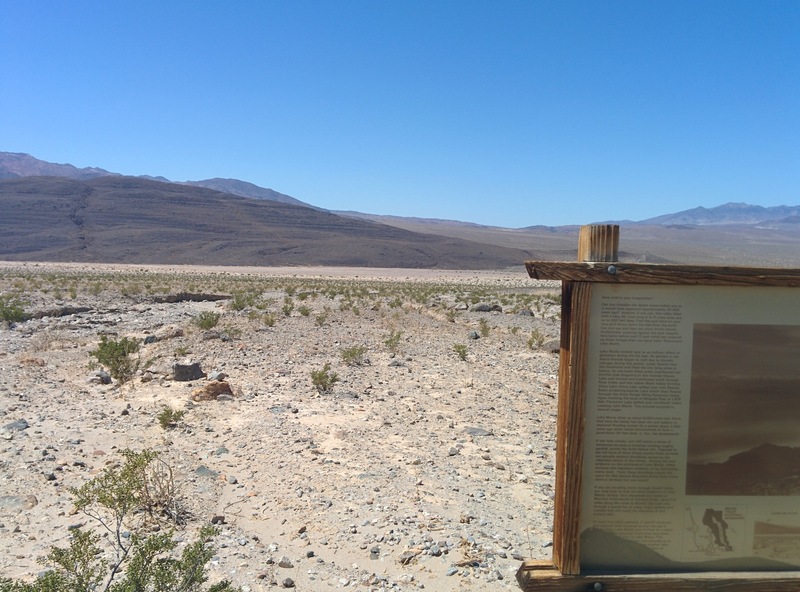 Apparently a lake once covered almost the entire floor of Death Valley up until about 10,000 years ago! 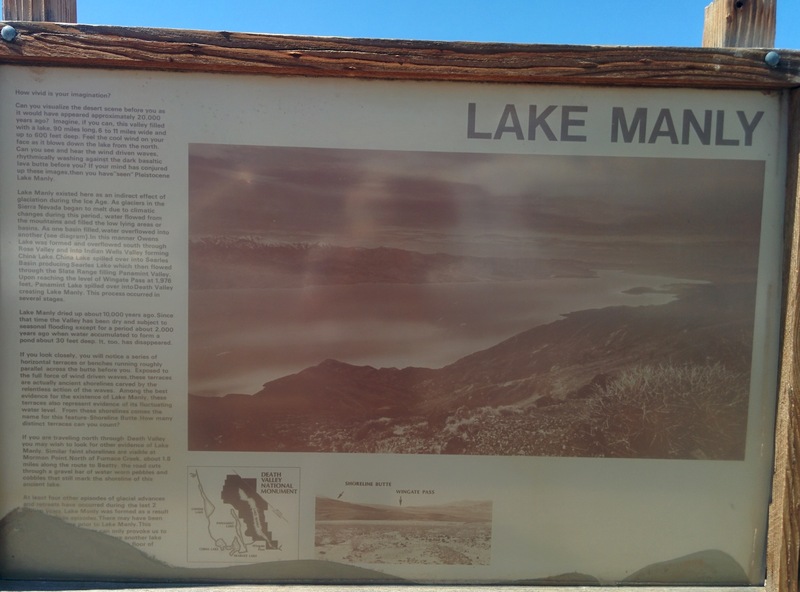 The sign gave us a quick overview of the history of the now disappeared Lake and we found out some more interesting information at the Wikipedia Lake Manly entry. Smiling introspectively at the thought of what that would have looked like standing there 20,000 years ago we got back on the road for the less than 2 miles to the Ashford Mill Ruins. You make more money milling as close to the ore extraction point as possible so as not to have to ship the heavy, bulky ore long distances. 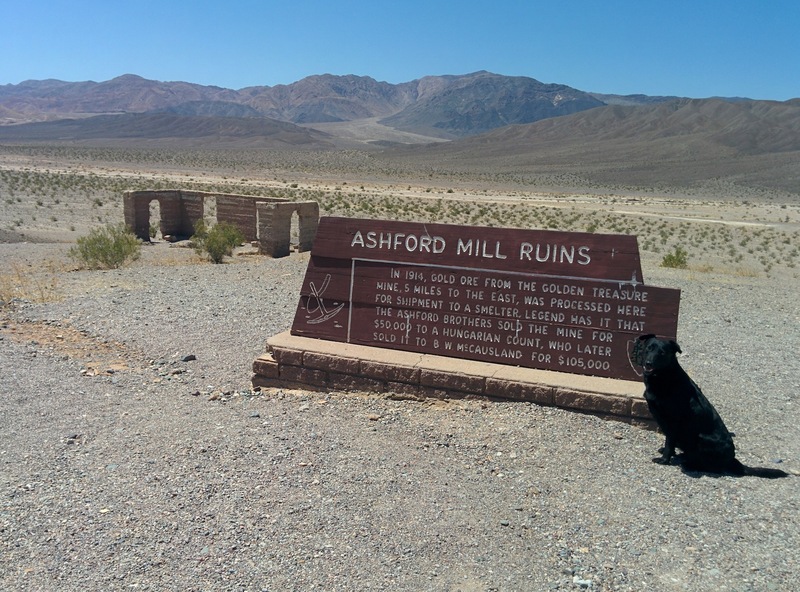 The Ashford Mill was built in 1914-15 by the three Ashford brothers, Harry, Henry and Rudolph to mill the ore they were bringing out of the Black Mountains three miles to the Northwest. 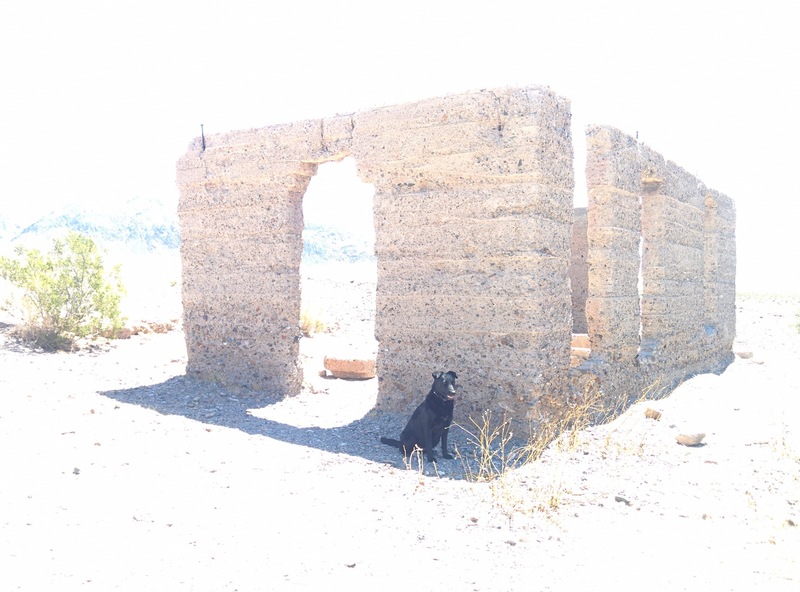 As the story goes, the gravel nearby was inspected and declared suitable to be used in concrete so the brothers ordered a railroad car load of cement. When the load arrived they discovered that they had been sent two carloads of cement instead of just the one they ordered. After writing their supplier about the mistake they eventually received word back that it would cost more to ship it back than the cement was worth so they could have it with the supplier’s compliments. 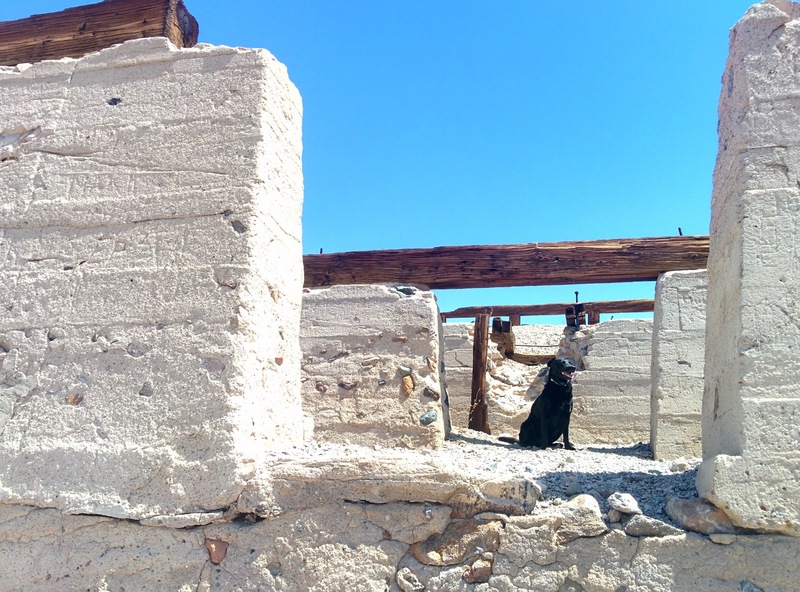 Their construction foreman used a rich 4-to-1 mix and used the extra concrete to thicken the walls of the mill substantially more than was called for and that is why they still stand today. Supposedly, because of a legal screw up by the brothers they “sold” the mine to someone else who then refused to pay them. They sued and eventually lost and so, for a short while, they carted ore out by horse-drawn wagon past “their” idle mill until it was economically unfeasible to continue. From our visit to the Furnace Creek Visitor Center we knew that the paved road at the South end of the Valley heading East towards Shoshone (Hwy 178) was closed due to flood damage. 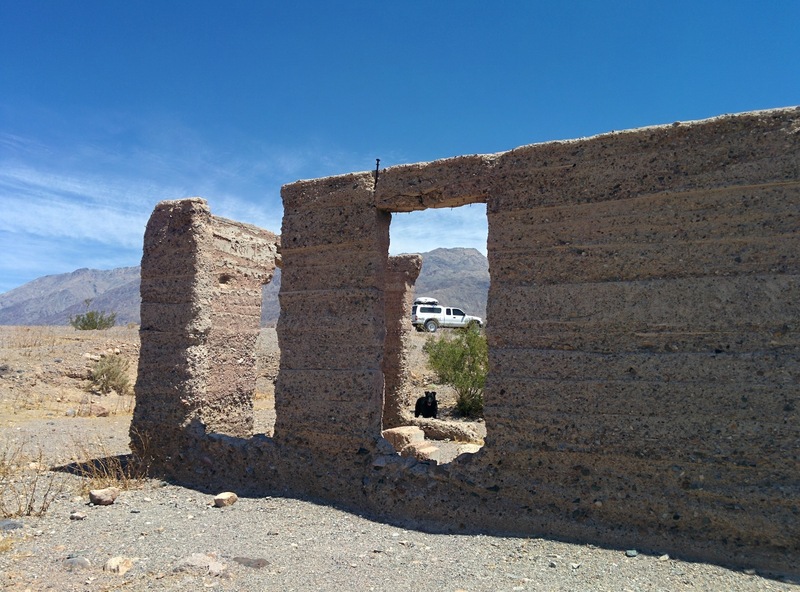 Our only other option was the Harry Wade Road which continues on straight into the Southern Death Valley sands, essentially two miles past the ruins of the old Ashford Mill. We took the opportunity to quickly air down using our Coyote Automatic Tire Deflators as we had been told by the Rangers that there were substantial sand drifts across several areas of the road and getting bogged down in sand is no fun, especially if you have to rescue yourself. Aired down to a cushy 18psi we immediately transitioned back into Ironman Stewart mode as the washboard was spaced just so that the speed limit was unbearable and driving faster helped us skip across the tops of the bumps. After what seemed like an hour of back and forth speeding up to bounce nicely over washboard, back again to soft, fun sand, back to picking our way slowly over and around rocky areas back and forth, over and over we eventually made it out to Hwy 127 also known as Death Valley Road where we found this roadside historical marker explaining a bit about Harry Wade and his adventure back in 1849. As the story goes he was with a large group in a wagon train heading to California to participate in the Gold Rush. 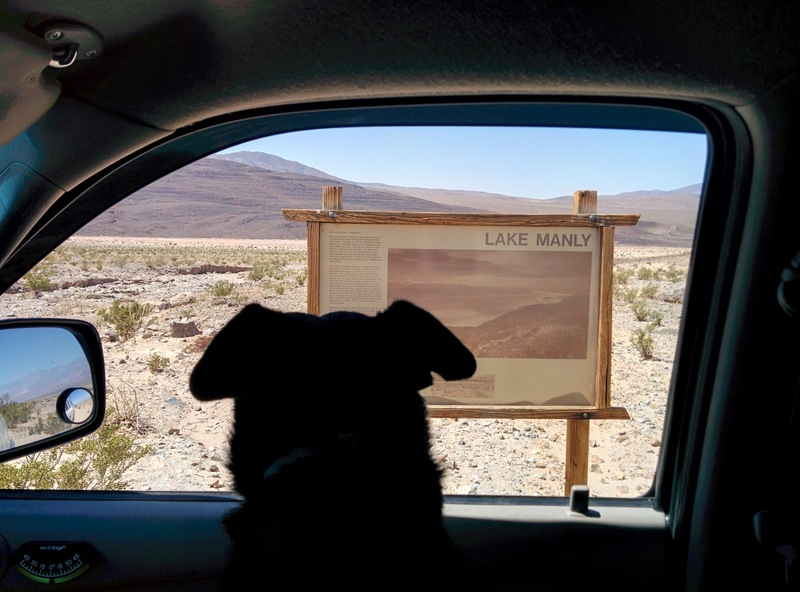 They arrived in Salt Lake City too late in the season to make it over the Sierra Nevada Range and so attempted to find another way around the mountain range and ended up in Death Valley. Low on food and their oxen starving as well they decided “every man for himself,” burnt their wagons, slaughtered their oxen and split up into smaller groups to each try to find a way out of the hellish environment they found themselves in. 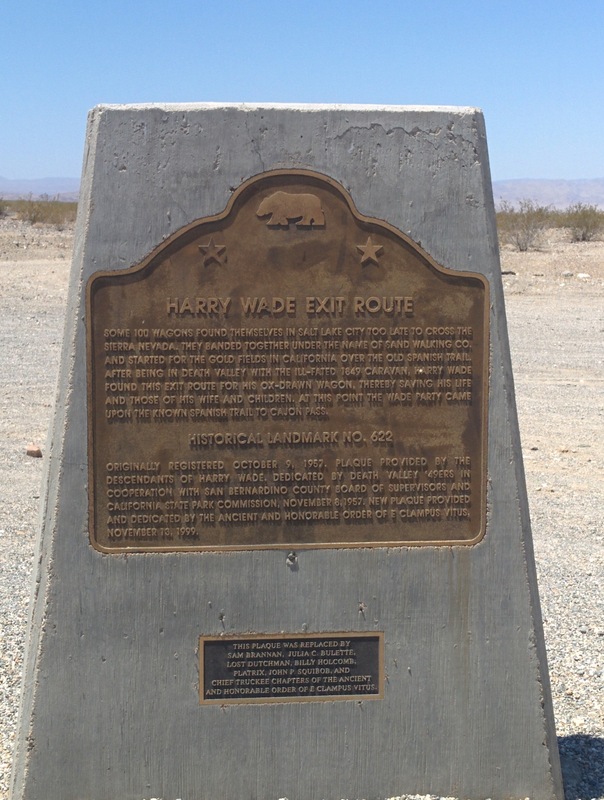 Only one man, Harry Wade, decided to keep his wagon intact and with his wife, four children and a few others they headed south. Sending scouts ahead to look for springs by looking for greenery in the otherwise brown wasteland the main group would wait for a signal fire from the scouts indicating a good find and then the main party would head towards the smoke. This way, they slowly made their way down and out of the valley until they found the gap between the Avawatz Mountains and the Ibex Hills near where the marker sits today. 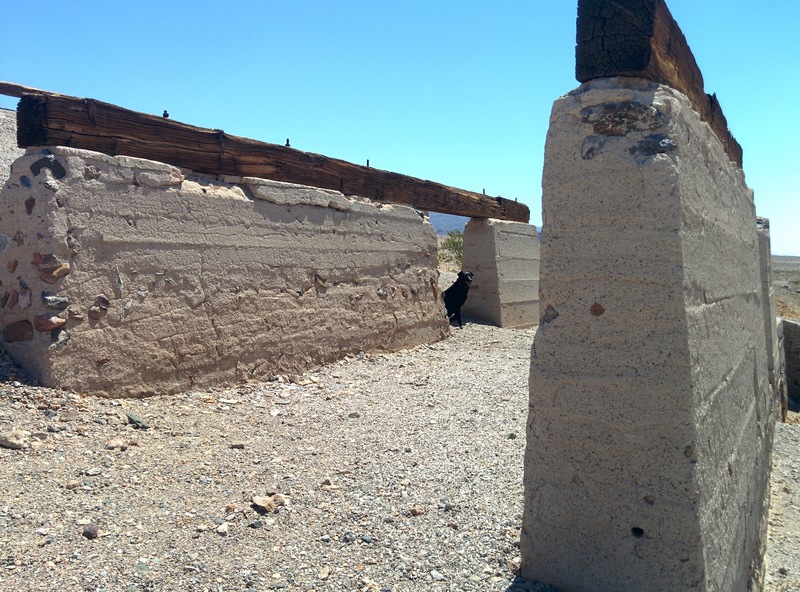 They continued on and eventually found the existing Old Spanish Trail along the Mojave River somewhere near Barstow, CA and crossed the Cajon Pass into San Bernardino on February 10, 1850. He eventually settled in Alviso, CA and died on October 13, 1883. At this point we were now officially outside the boundaries and our Death Valley National Park adventure had come to an end. Before we continued onto paved roads we aired back up to a much more fuel-efficient, non-bouncy and smooth 51psi and then got back on Highway 127 heading South towards Baker. We made a quick pit stop for gas and then continued on our way towards our next adventure which was to be somewhere along the Mogollon Rim in Arizona.